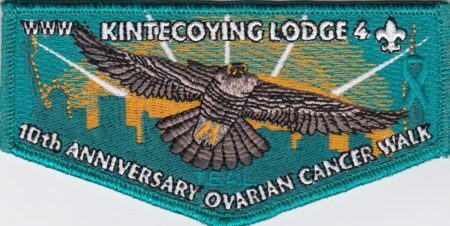 Since the inception of the TEAL walk, Shu Shu Gah Lodge #24 had a contingent helping out each September, the tradition was continued with Kintecoying Lodge participating each year. Celebrating the 10th Anniversary Ovarian Cancer Walk by issuing a Fundraiser flap. There were 250 of these flaps made.